Months after seeing the first photo with John Boyega on the set of Pacific Rim: Uprising, the actor has shared an official photo of his character, Jake Pentecost, on social media. 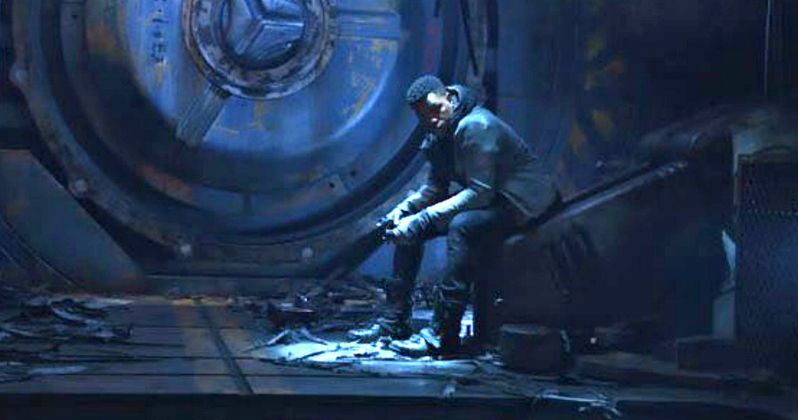 The actor wouldn't offer much else in the way of details only stating, "I am Pentecost 2018 #PacificRimUprising," with the image showing Jake sitting in what looks to be an abandoned silo. Filming first got under way in early November, although it still isn't clear how much is left for principal photography on this highly-anticipated sequel. The actor shared this new image on both Twitter and Instagram, which comes just one day after another set photo surfaced that offered our first look at Scott Eastwood in his Jaeger pilot suit. We've previously seen John Boyega on the set in his Jaeger suit, but there is still very little revealed about his character, other than he's the son of Idris Elba's Stacker Pentecost from 2013's Pacific Rim. Nothing about Scott Eastwood and all of the other new cast members has been announced at this time, but a recent set photo did confirm some characters from the original movie. Last month, cinematographer Dan Mindel sent out what he thought was a fairly innocuous set photo on Instagram, which was meant to showcase the Alexa XT camera he was using that day. What he apparently didn't realize at the time was there was a partial cast list attached to the camera, which featured previously-confirmed stars such as Scott Eastwood and Cailee Spaeny, along with a number of actors who have not yet been announced or confirmed. These actors include original Pacific Rim stars Rinko Kikuchi (Mako Mori), Charlie Day (Newton Geisler) and Burn Gorman (Gottlieb) and a previously-unannounced new cast member Karl Urban. The photo has since been removed from Dan Mindel's Instagram account. It was confirmed last summer that another original Pacific Rim star, Charlie Hunnam, will not be returning to reprise his role as Jaeger pilot Raleigh Beckett, although he did add in an interview that he's "excited" about it and he's glad they're making it. However, last month, John Boyega shared concept art that teased Gipsy Danger, the massiver Jaeger co-piloted by Raleigh Beckett, will return in this sequel. It's possible that his character will be piloting this Jaeger in the sequel, but there has been so little revealed about the plot that we can't be certain. We do know that Pacific Rim: Uprising has been given a February 23, 2018 release date, which is currently by itself on that date, although that will surely change. It will also fall between Marvel's Black Panther and Universal's animated movie Larrikins on February 16, 2018, and Warner Bros.' shark thriller Meg and an untitled 20th Century Fox/Marvel film on March 2, 2018. Stephen S. De Knight (Daredevil) is directing Pacific Rim: Maelstrom from a screenplay that has been worked on by Guillermo del Toro, Travis Beacham, Jon Spaihts, Emily Carmichael, Zak Penn, Kira Snyder and Derek Connolly. Take a look at the latest image from Pacific Rim: Uprising, as production continues on this highly-anticipated sequel.